Photo for illustrative purposes only. Stock image. Police have on numerous occasions issued warnings to alert motorists not to place valuable items where criminals are able to see them from outside vehicles. A smash-and-grab victim was lucky to recover her stolen high-priced cellphone, after a pair of thieves robbed her of her handbag, Boksburg Advertiser reports. The victim was waiting for the traffic light at the intersection of Van Dyk Road and Commissioner Street to turn green. According to Boksburg SAPS’ spokesperson Sgt Cebisa Maseko, the thieves smashed the window of the Van Dyk Park woman’s car and grabbed her handbag before they ran away at about 5pm on April 8. 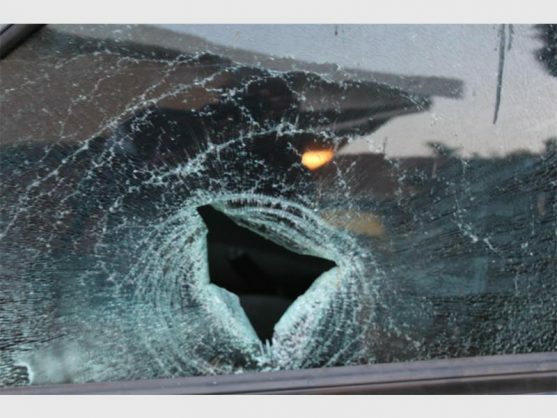 Unbeknownst to them, the people driving in the unmarked vehicle behind their target were members of the SAPS’ crime prevention unit, who were carrying out regular patrols. “Upon witnessing the crime in progress, officers quickly jumped from their vehicle, chased the thieves on foot, and managed to catch them. “They were found still in possession of the stolen cellphone which was inside the handbag,” said Maseko. It is believed they dumped the handbag in the bushes near where the incident had taken place. Maseko said the pair come from KwaThema, Springs, and are apparently responsible for the previous smash-and-grab robberies that have occurred in the same spot. The arrest is therefore a major breakthrough. “Our detectives are reviewing the other smash-and-grab cases in the area to see if the two men can be linked to those cases,” adds Maseko. Both suspects, aged 36 and 37 respectively, have appeared in the Boksburg Magistrates’ Court where they were remanded in custody and the matter was postponed to April 13 for a formal bail application. The intersection of van Dyk Road and Commissioner Street is one of the identified hotspots for smash-and-grabs, and police remind drivers to always be on high alert. Thieves target unsuspecting drivers, women in particular, in slow-moving traffic or when they are waiting for the traffic light to turn green. Maseko said it appears that thieves are mostly attracted to valuable items that are kept in plain sight, such as cell phones, handbags and laptops. She, therefore, urges drivers not to place any valuable items on car seats or inside vehicles, where they can be easily seen by would-be-thieves. The Boksburg police have compiled a list of the areas that have become problematic in their policing precinct, with several smash-and-grabs taking place there. Ward 31 councillor Ashley Hoods recently said he is concerned about the rampant crime, which includes smash-and-grabs, murders and robberies. With regard to the smash-and-grab crimes, Hoods said a request should be made for warning signs to be erected in the areas police consider to be hotspots. He also suggested that the police management come up with strategic crime prevention tactics, including the deployment of plain-clothed policemen in such high crime zones.